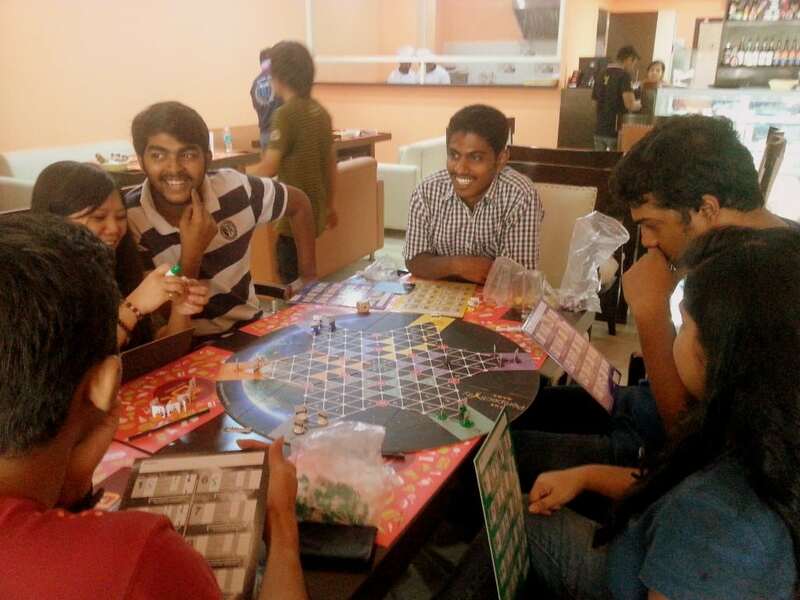 Perspectivity Bangalore conducted an open-game session on the 24th of May. The game was played with 7 participants on one board, facilitated by Anubhav Khanduja. It was an interesting session primarily because of the flavor of background of the participants. One-half of the participants work under the brand “Cow that jumped over the moon” as board game designers to make corporate trainings interactive and self-reflective at many levels. The other half was a group of software developers from MNCs. Dice N Dine, a board game café turned out to be a perfect venue of choice. Once the initial rules were given away to the playing crew, participants jumped into the game in full throttle. It was in the third round of the game and the dice had taken the first toll on the factories, when the first animated and surprised reactions could be seen. The game went on to become more fun when the participant hit by economic crisis tried to threaten a rich nation with the possibility of him launching a terrorist attack on the rich nation, kudos to the economic crisis card. One of the participants tried to co-relate the relationship between the normal factories and the disasters but as a team no consensus was reached. Although the final score didn’t do justice to the amount of positive dialogue and collaboration among a couple of teams, the players related very well to the dynamics that brewed up during the game to the instances from daily life. Every player had something unique to add and share with everyone which added to the experience of the entire game session. It was a great Saturday in all for everyone.